My first two tries didn’t make the cut. 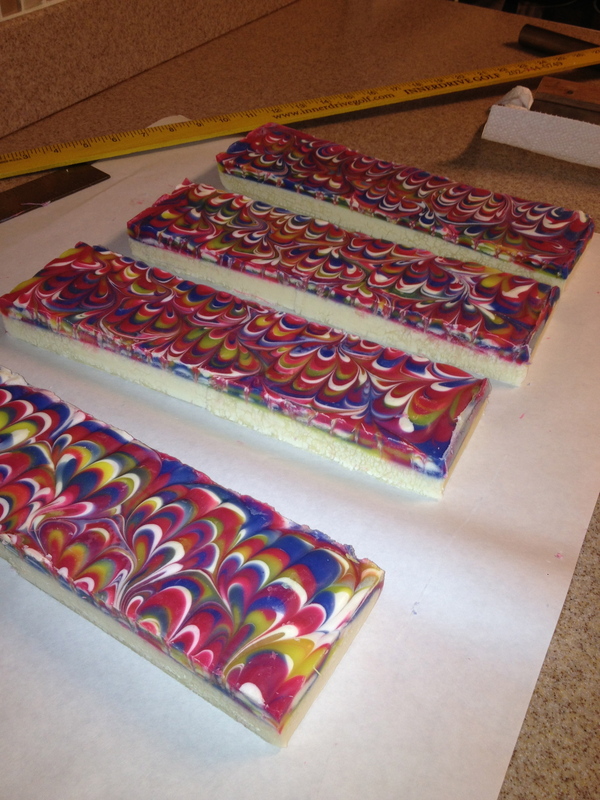 I was willing to give it one more try since I really like the way a peacock swirl looks and I want to add it to my soap line up. 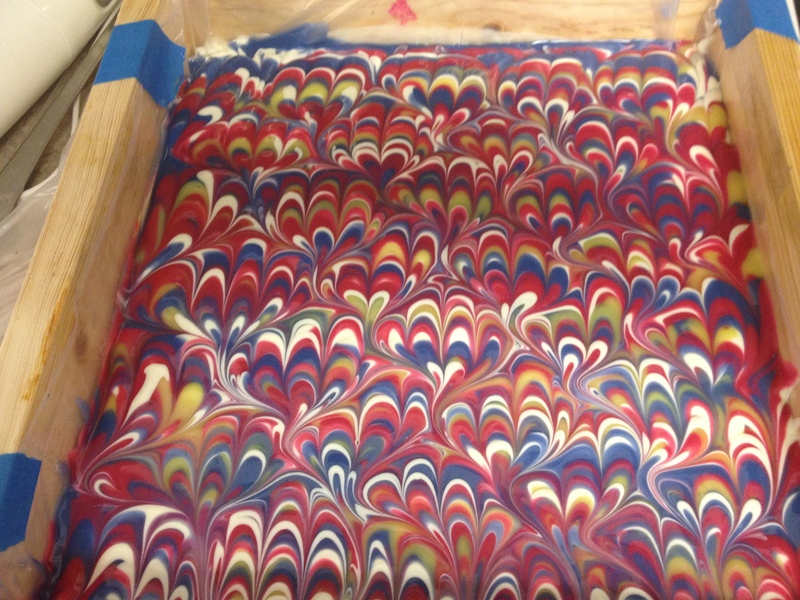 This time I decided to go with red, white and blue since I was running out of time to make a 4th of July soap. Since we were supposed to use four colors, I added a little yellow in the design. I was afraid to tinker with the colors because I didn’t want another failure but I needed a darker blue and a red red. So I added a little black oxide to ultra marine blue and for the red I remembered that someone had shared that they added red brick oxide and merlot sparkle to Brambleberry’s Electric Bubble Gum mica. This was a gamble as I don’t have much experience at mixing colors. I had just received some new supplies that included Raspberry Lemonade fragrance oil (it smells so good I just had to try it). Besides what could be better on a summer’s day then raspberry lemonade? It was a lot of fun and I am already looking forward to the next challenge. Thanks Amy for putting this together for all your hard work to make it happen. This entry was tagged Peacock swirl challenge. Bookmark the permalink. Wow! So pretty! Love the bright, bold colors! 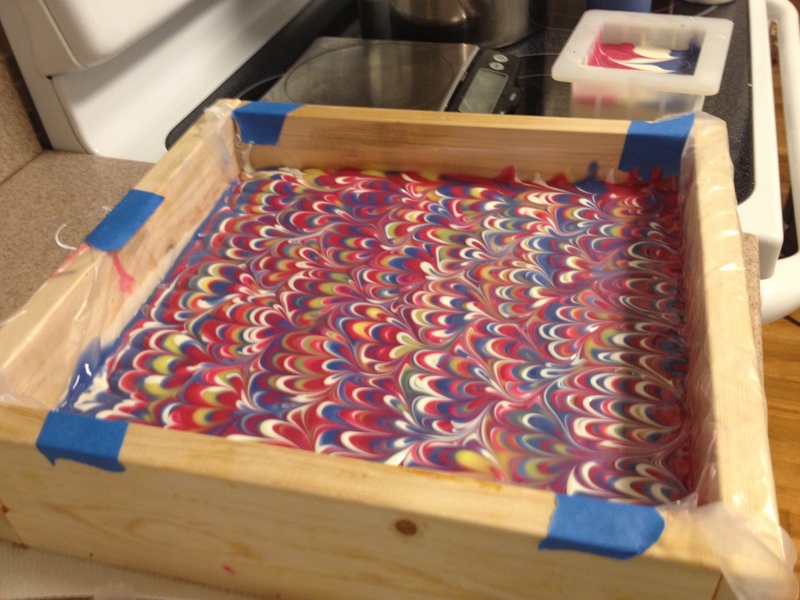 Definitely a great 4th of July soap! Thanks Amy. I really enjoyed the challenge and appreciate all the work you put into making this happen. They turned out great! I can’t wait to try WSP raspberry lemonaide too :). Traci — I am still loving the raspberry lemonade. I didn’t put it in the colored part but think it might be one of those fast movers. I was ready to pour the base when I put the fragrance in. It didn’t seize, just accelerated trace noticeably and I am thinking I’ll be careful the next time I use it to see what it does before I use it in something that requires a lot of time. I absolutely love this. Your colours are absolutely fantastic. Well done and good on you for not giving up! Thanks Lindalu. I enjoyed the challenge and now I doubt that I’ll forget the swirl technique. Amazing, love it! Beautiful colours and swirl. Thank you. So glad you like it.